As a library administrator, you can configure and manage roles in a library. Note: Custom roles are specific to the library and are not visible to other libraries. The custom roles are listed below the predefined roles. Learn more: What are permissions in AODocs? 3. Press the add button at the top right of the list of roles. 4. In the Add role pop-up enter the name of the new custom role and, if required, a description. 5. Press Create role. You can now add members. 1. When you create a role, or when you press the name of a role in the list, the Members list is displayed. Tip: You can use the breadcrumb to navigate back to the list of roles. Enter names or email addresses of individuals or Google Groups in your domain, then press Save. 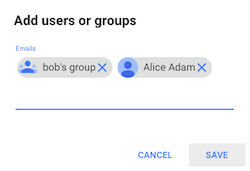 AODocs supports nested groups, so if you select a Google Group with nested groups, the members of the nested group will be members of the role. This option is used when the members of the role need to be different for each document. You can add document system properties or custom properties with a Person type field to a custom role. - Leave the default setting Any class. - Document creator: when users create documents in the selected class, they become members of the role. - Last update author: the last users to edit documents are members of the role. - Select a document class. - Select one of the Person type properties defined in the document class you selected. All users specified in the selected properties of documents are members of this role. For example, if Caroline is defined in the property "Attorney in charge" on a "Contract" document, Caroline will belong to the role "Contract validators" for this contract. Note: The Add Person option isn't available for predefined library roles. Select this option to add to this role all the members of the Readers, Contributors and Administrators roles. 3. If required, you can mark for delete any existing members of the role. 4. Press Save in the top right of the screen. 1. Open the More actions menu next to the role you want to edit. 2. Select Edit name and description. 3. In the Edit role pop-up, you can edit the name of custom roles and the role description. Note: You can't edit the names of predefined library roles. Note: You can't delete predefined library roles. 1. Open the More actions menu next to the custom role you want to delete. 3. Press Yes in the confirmation message (or No to cancel).